The market is hot, but is it still distressed? People think I’m nuts sometimes when I tell them the real estate market is still distressed. I get one of those, “What’chu talkin’ ’bout, Willis?” looks (you’ll only get that if you watched the TV show Different Strokes). Let me explain. 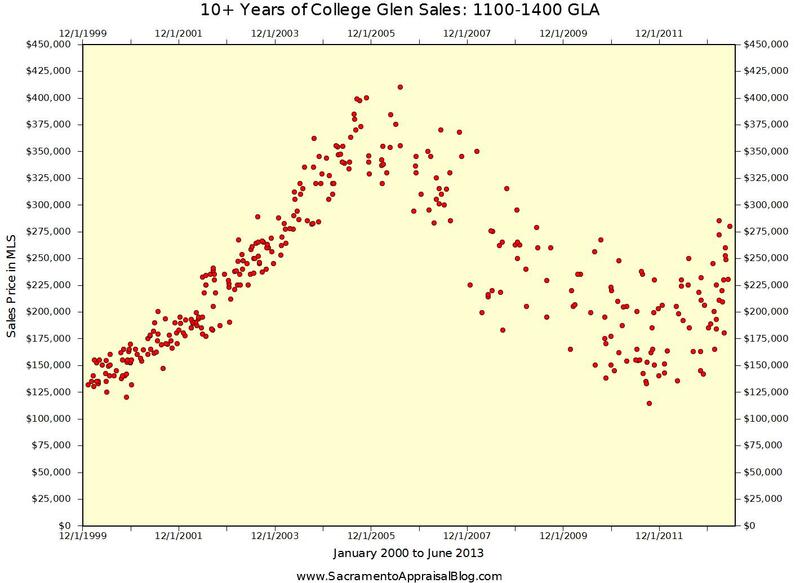 As an example, let’s look at sales over the past 13 years in the College Greens / Glenbrook neighborhood in Sacramento. If you didn’t know, the market in Sacramento basically increased in value for 8 years from 1997 through 2005 as shown above in part. The rise in prices was very tight before 2005, wasn’t it? When the bubble burst though at the peak, prices really began to spread apart (“bifurcation” is the fancy real estate word to explain this segmentation). Even now, despite the market being “on fire”, we still see current sales have a far wider price spectrum than before 2005. What does this tell us? When looking more closely at price differences in the neighborhood, it’s easy to see both REOs and Short Sales tend to sell for less than traditional sales. This doesn’t mean normal sales always sell for more of course, but generally speaking that is the case. Since distressed sales are still ample in the neighborhood and county as the market experiences a correction and upward movement, we’re still seeing a wide array of prices. If the market continues to increase over time and distressed sales continue to decrease, I would suspect we’d see the trend line squeeze together more tightly like it used to be ten years ago. What I’m NOT Saying: I’m not saying that distressed sales are driving the market like they used to several years ago. That’s not the case anymore…. at all. However, we still see the impact of distressed sales in today’s market, don’t we? While the price gap is closing because distressed sales are tending to sell at more competitive levels to normal sales, there is sometimes still a big difference. Ultimately, in the midst of rising values, we still have 1 out of every 3 sales in Sacramento County as either a foreclosure or short sale. While these sales don’t drive values in today’s market, they are still a factor in local real estate. That is what I am saying. By the way, click on the thumbnail above to see a larger graph.